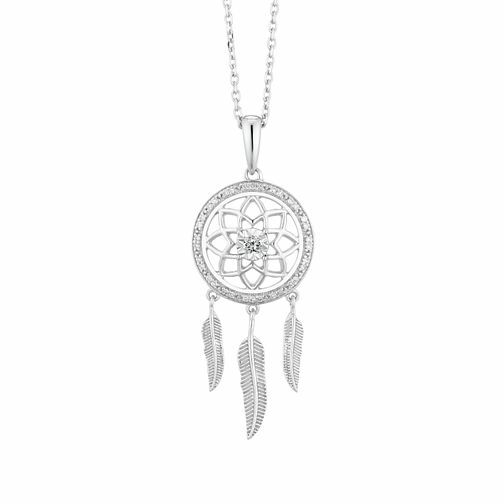 Keep your dreams close to your heart with this sterling silver diamond dreamcatcher pendant. Its beauty is showcased with gorgeous April birthstones and a diamond in the centre of the pendant. A stunning dreamcatcher style pendant. Sterling Silver Diamond Dreamcatcher Pendant is rated 5.0 out of 5 by 1. Rated 5 out of 5 by Anonymous from Beautiful, a pleasure to wear I love my dream catcher necklace - I’ve had so many compliments when I wear it - it really gets noticed. A beautiful piece of jewellery that means a lot to me.